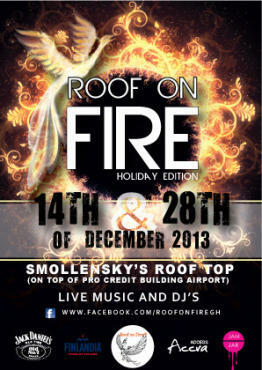 Roof on Fire Holiday Edition Alternative nightlife Airport Residential Area Until Sat Dec 28 Roof on Fire, Accra, Ghana Roof on Fire, Accra, Ghana Roof on Fire, Accra, Ghana Not yet ratedBe the first. DJ Just_Ice and guest DJ Doors open at 20.00 Pre-Sale tickets GHC10 (GHC15 on the door) Tickets can be bought from Lokko T-Shirt (next to Kingdon Bookshop, Osu) or order on the Facebook page https://www.facebook.com/Roofonfiregh. This entry was posted in EVENTS and tagged Accra, Facebook, Ghana, Kingdon Bookshop, The Doors.